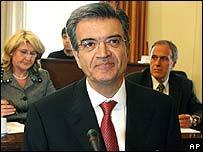 Costas Tsalikidis: Did he help set up the phone-tapping? A senior aide to the Greek prime minister is expected to be the next person to testify before a parliamentary committee investigating what is believed to be the worst espionage scandal in the country's history. Last month, the government admitted that the mobile phones of the prime minister, the most senior members of the cabinet and top security officials had all been tapped in 2004 - the year Athens hosted the Olympic Games. The committee in Athens has been questioning executives from two of the world's leading mobile phone companies, Vodafone and Ericsson, about the scandal. But attention is also increasingly focusing on the alleged suicide of a senior Vodafone manager just after the phone-tapping operation was discovered on the Vodafone network last year. In a serene but cramped graveyard in the western suburbs of Athens, lies the body of Costas Tsalikidis, a network manager for Vodafone Greece. He is buried with other members of his family. But his gravestone shows he died aged just 38. He was found hanged in his apartment on the morning of 9 March last year. The next day, the head of Vodafone Greece walked into the office of one of the prime minister's top aides to inform the government that its phones had been bugged for at least eight months. 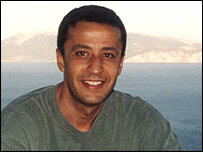 The official verdict was that Mr Tsalikidis had committed suicide. In a statement issued last month, just after the story about the phone-tapping operation first broke, Vodafone categorically denied there was any connection between his death and the scandal. "Any attempt to connect these two is, to say the least, irrelevant," it said. But his family believe his death is suspicious and are calling for his body to be exhumed so a second post-mortem can be carried out by one of the world's leading forensic pathologists, Dr Michael Baden of the United States. "They believe they will find new evidence," says the family lawyer, Themis Sofos. Dr Sofos adds that other parts of the original investigation were weak. "No one went to the house of Costas, no one took photos and to see the circumstances of his death... no one took fingerprints." Mr Tsalikidis' family recently took matters into their own hands, filing a lawsuit against "persons unknown" for complicity in his murder or suicide. They allege that even if he was not murdered, he may have faced threats which left him with no choice but to take his own life. Meanwhile, their lawyer has been handing evidence to a prosecutor in Athens, who is now carrying out an official inquiry into the death of Mr Tsalikidis. The prosecutor is expected to announce his conclusion within the next few weeks. Family and friends of Costas Tsalikidis believe there are strong indications he was the person who first discovered that highly sophisticated software had been secretly inserted into the Vodafone network in 2004, enabling at least 100 phone lines to be constantly tapped. "The end of January or early February (2005) I think is the time Costas had access or took knowledge of the interception system and he (re)searched about its function and origin," says lawyer Themis Sofos. "He was not the kind of man to keep secret about something. He would not have co-operated with criminals or criminal acts." According to Dr Sofos, Mr Tsalikidis told his fiancee at this time that it was a "matter of life and death" that he leave his job. The lawyer also says they have looked at text messages he received on his mobile from colleagues in early February 2005, including one which apparently urges him to keep working and offers him support. But there is another theory about Costas Tsalikidis: that he was allegedly the person who actually inserted the software setting up the phone-tapping operation. "It is possible," says Themis Sofos. "I cannot exclude anything." The theory is put forward by John Brady Kiesling a former American diplomat who worked at the US embassy in Athens until resigning in 2003 over the US-led invasion of Iraq. He is convinced American intelligence agents were behind the whole bugging operation and he says it is possible they used Mr Tsalikidis to install the software. "I believe he committed suicide to protect his professional honour," says Mr Kiesling. As for why the Americans would tap the phones of the political and security elite of a country regarded as an ally, Mr Kiesling says there is a simple answer. He argues American intelligence agencies would not have trusted the Greeks with the massive security operation surrounding the Athens Olympics in August 2004 set up to counter any potential terrorist threat. "They believe you cannot trust foreigners, that foreigners are incompetent and of dubious trustworthiness," he says. "You owe it to yourself if you have the capability, to have an independent ear listening to them and I think that is what this was." This might also explain why the Greek government kept silent about the scandal for almost a year from March 2005 when it was informed about it, until last month when it finally held a news conference detailing what had happened. The news conference took place shortly after a Greek newspaper had broken the story. Despite repeated requests, no-one from the government was willing to give an interview to the BBC about the scandal. The US embassy also refused to comment and the Vodafone Greece press office would only refer us to statements on its website.